The week-long strike by State Bank of India employees was called off tonight following a settlement, which gives higher pension to 2.10 lakh staff of the country’s largest commercial bank. Union Human Resources Minister Arjun Singh today denied the Election Commission’s charge that he has prima facie violated the model of conduct for elections by announcing plans for reservation in elite educational institutions and said the Centre has not decided on the percentage of reservation. Is demilitarisation of the Siachen glacier is viable in the near future? Big brother has just got bigger. The Department of Telecom (DOT) last week issued an order to all private cellular service providers that they will have to provide ‘‘monitoring’’ on all value-added services. In other words, not content with the right to tap cell phones, the government now wants snooping rights over short message service (SMS) and GPRS-enabled e-mail currently provided through Blackberry and other assorted instruments. Private players seem to have taken over wheat purchase from government agencies here. 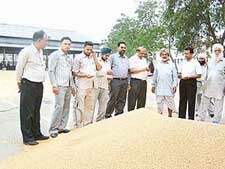 Private flour mill owners strike a deal while inspecting the wheat brought by farmers to the Khanna grain market on Sunday. The Punjab and Haryana High Court Chief Justice, Mr Justice D.K. Jain will be administered the oath as Judge of the Supreme Court tomorrow morning. According to sources, Mr Justice Jain would be administered the oath by Chief Justice of India Mr Justice Y.K. Sabharwal. The Punjab Public Service Commission (PPSC) has decided to hold the examination for filling 63 vacant posts of Punjab Civil Service (Judicial) from April 25 to 29. According to sources, a decision to this effect was taken recently by the PPSC following a go-ahead by the Punjab Cabinet. Germany has rejected the asylum petition of five Indians who were smuggled into Germany as part of a dance troupe, official sources here said today. 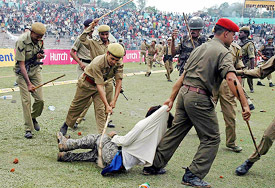 The five included Randeep Singh, Gurmeet Kaur, Amanpreet Singh and Satnam Singh who had sought political asylum in Germany on the pretext of being “Sikh” who were subjected to gross human rights violations.